Plan Your Trip to Sand Valley with detailed caddy information and golf and lodging policies. We understand that golf trips take a lot of preparation and coordination. 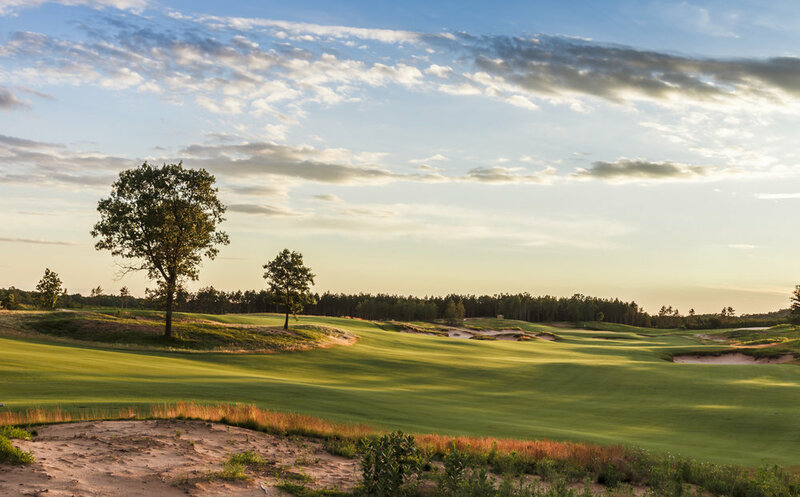 We want to make sure you're well equipped to make the best decisions to plan an amazing golf trip at Sand Valley. With that in mind we've prepared the below to help you understand our offerings and policies, and to plan your trip. If you have any questions or want to discuss any details of your trip with one of our team members, please just reach out and one of our team members will be happy to assist. CLICK TO VIEW A SAMPLE ITINERARY FROM SAND VALLEY MAGAZINE. At Sand Valley we believe that the game of golf is best experienced by walking the course, especially when you have the help of a caddie to guide you. Caddies come to Sand Valley with a variety of backgrounds and experiences. Here are the expectations for level of expertise and payment. Our goal is to enhance your experience, improve your game and make the round even more enjoyable. Our A level caddies are professionals who travel to Sand Valley for the season from other golf facilities, professional tours or who happen to live nearby. These caddies can offer invaluable insight about hole locations, carry yardages, playing conditions, club selection and will be excellent guides around the course. Our Junior level caddies are often new to the game and have an age range from 12 to 17. You can expect them to carry your bag, offer yardages when requested and simplify your on-course experience by raking bunkers and tending the flag. Many of these caddies are also vying for the Evans Scholarship, which is need based and awarded to those with a strong caddie record, excellent grades, and outstanding character. *All Caddie rates are in addition to greens fees. Caddie payments are to be paid directly to your caddie in cash. Additional gratuity, although not required, may be added and should be paid to the caddie directly, in cash, at your discretion. There is an ATM in the Sand Valley Clubhouse. Guests may also charge their rooms or credit cards for cash to pay caddies upon request in the Pro Shop. *Unlike many resorts, a caddie fee is not paid in the Pro Shop. At Sand Valley, the entire caddie payment goes directly to the caddie in cash. The golf courses at Sand Valley feature fescue grass in our fairways and "rough" hazards and bent grass on our greens. These are types of grass that provide firm and fast playing conditions that mimic the playing conditions at Links courses in Scotland and Ireland, where the game began. While every player chooses to play differently, playing on firm and fast playing conditions generally forces the player to use the "ground game" (putters from off the green, bump and runs with a lower iron, etc.) to his or her advantage instead of trying to use lofted wedges to try to control the ball through loft and spin. The firmer playing conditions mean your ball will generally roll out much farther than you might be used to AND that it can be harder to pick the ball clean from the fairway. When in doubt from just off the green, when choosing between a lofted wedge and a putter, go with the putter! Practice Center: A short shuttle drive away from all 3 courses, the practice center provides a full driving range, short game area, 2 practice greens and greenside bunkers allowing you to work on every area of your game. Sand Valley’s Warm Up Range: Located just 50 yards from the 1st tee of the Sand Valley course. This warm up range enables you to hit any club in your bag and get your ready for a day full of golf. The range closes at 1:00pm as it also serves as an intriguing finishing hole of Sand Valley’s 6-hole loop that is available for play late in the afternoon. The practice green is available for both putting and chipping all day. Shuttle service is available to take you from the Clubhouse, Pro Shop, and all lodging units to and from the first tee of Sand Valley, Mammoth Dunes, the Short Course, the Practice Center, or your car. All guest rooms have an in-room telephone with a "Shuttle" speed dial button. Links Lesson: $50 per person. Learn how to play off firm turf in windy conditions. Group and Junior Lessons: Please contact the Golf Shop for information and rates. Golf and Lodging Reservations: The deposit is equivalent to the first night's room rate for each room reserved, and the first greens fee per person and is due at the time of booking. Golf Only Reservations: Credit card information is required to reserve your tee time in advance but your card will not be charged. Please see below for cancellation policy. Group Reservations (16 or more – corporate or master billing): Deposit payment and dates due are detailed in the group contract. Contact a group coordinator for questions or concerns. General Reservations: We require all room and golf cancellations be made a minimum of 30 days prior to arrival date. Any cancellations/reductions made inside 30 days will result in forfeiture of the full deposit. * Any cancellations/reductions made inside 10 days during the time periods listed above will result in forfeiture of the full deposit. Group Reservations: We have a 90-day cancellation policy. Please refer to your contract. If you have any questions or need to make any changes, please contact your group coordinator. Should you choose not to play your round of golf due to inclement weather, you will need to contact the golf shop directly while on-property. You will be charged for and issued a voucher that is redeemable for future golf or golf merchandise. Once you tee off, you have committed to the round of golf and are not eligible for a voucher. Replay rounds may be cancelled at any time without penalty. Are there Golf Carts at Sand Valley? Sand Valley is walking-only, however riding golf carts are available to all guests with a permanent disability that prevents them from walking their round. Such a request must be accompanied by a doctor’s note and approved prior to arrival. Call 888.651.5539 to inquire about availability. Are there Pull Carts? How much do they cost? Yes, we have pull/push carts available ($10 per day) or you may bring your own. The sand and lack of paths can be difficult on motorized pull carts. We have club rentals for $60 per day which come with 2 complimentary sleeves of golf balls. Advance reservations recommended.